Zion Market Research has published a new report titled “Boat Market by type (Pleasure boat, Fishing boat, Commercial boat, and Military boat): Global Industry Perspective, Comprehensive Analysis, and Forecast, 2016 – 2022”. According to the report, the global boat market was valued at around USD 24,243.5 million in 2016 and is expected to reach approximately USD 42,046.3 million by 2022, growing at a CAGR of 9.7% between 2017 and 2022. Boats are the watercraft traditionally used for transportation through sea, river, and lakes. Over the years the boating industry has evolved in a great way, extending a scope of boat applications in various fields including military, tourism, fishing, and import-export. Boats are available in different sizes, shapes, and designs depending upon the purpose of their application. The global boat market is expected to witness significant growth within the forecast period. The market is mainly driven by increasing disposable income, the growing trend of recreational activities, and innovative developments in the global tourism industry. Besides this, there are some restraining factors for the boat market, including labor-intensive manufacturing processes, government rules and regulations regarding environmental safety, and increasing cost of raw materials. On the basis of boat type, the market can be classified into pleasure boat, fishing boat, a commercial boat, and military boat. In terms of revenue, pleasure boat segment accounted for 73.98% share of the overall market in 2016. The fishing boat segment is another major segment and is projected to grow at a CAGR of 9.77% during the forecast period. North America boat market is the fastest growing market globally and accounted for 30.43% share in terms of volume in 2016. Europe was the second leading regional market with 28.88% of market share in terms of volume in 2016 and is projected to grow at CAGR of 7.78% during the forecast period. The Asia Pacific region accounted for 24.21% of market share in terms of volume in 2016. It is expected to experience noticeable growth over the forecast period. The global boat market is consolidated, with the key players accounting for a majority of the market share in 2016. 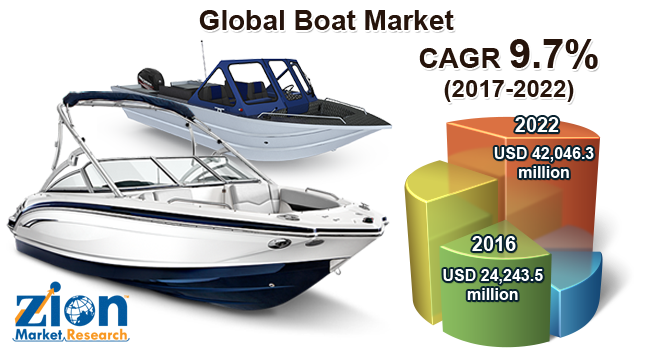 The major companies in global boat market are Willard Marine, South Boats IOW, Fassmer, HiSiBi, Asis Boats, LOMOcean Design, SAFE Boats, Maritime Partner AS, Sunbird Yacht, FB Design, BCGP, Alutech, Connor Industries, MARINE, and PALFINGER.